Exhaustion - but in time for weigh-in! 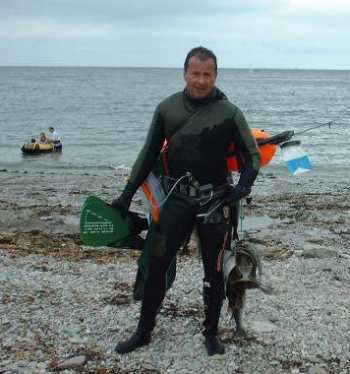 For the past three years Talland Bay has become the location for the Cornish leg of the British Championship organised by the London International Spear-Fishing Club. 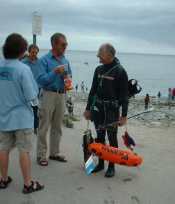 Last year's competition was held on Sunday 2 September 2001 and the operations centre was the Talland Bay Beach Cafe. 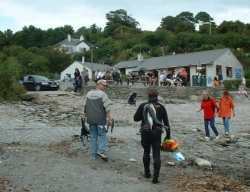 The competition started at 1000 hrs when a klaxon sent 45 running to their favoured parts of the four mile coast between Looe Island and Polperro harbour entrance. They fished all day but had to be back at the Beach Cafe by 1615 hrs for the weigh-in. 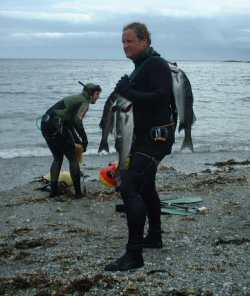 Two or three competitors only just made the deadline by the skin of their teeth, including Mick Veal, who was the Leader in the previous 5 legs of the competition. 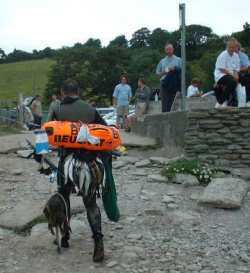 Having fished towards Polperro, he had to run back carrying all of his equipment and a very large catch - fortunately he did so just within time and collapsed at the weigh-in table with exhaustion from the effort. 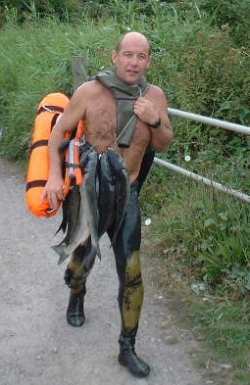 After a liberal dousing with mineral water he was back on his feet. 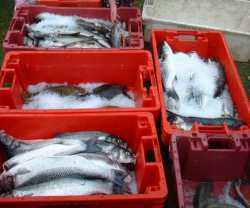 As with any form of fishing, luck ran out on some competitors, who returned with no fish at all, whilst others had heavy hauls. 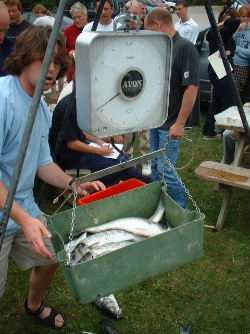 A variety of catches was made with good numbers and weights of Bass. 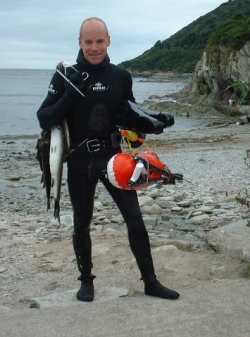 The biggest fish caught was a Bass at 2.650 Kg (Mick Veal) and the best catch of Bass was six fish weighing over 11 Kg. Winner of the day, and continuing champion of the Competition, was Mick Veal. 2nd was Martin Trotski and 3rd, Eric Smith. 4th was David Bailey. Winner of the Juniors section was Dan Bailey, and runner-up, Anthony Bailey. This was the second year running that a leg of the 5 stage competition has been held in Talland Bay - the first venue in Britain to have been visited more than once by the competition - fuller details of the prizewinners etc will be on this page as soon as we have the information from the organisers - visit again soon!